Programs for beginners and veterans. Completing a Full Marathon (26.2mi) is a life-changing event. A marathon finisher’s medal is a symbol of dedication, hard work, and the accomplishment of a challenging goal. Participants in our 16-week programs benefit from our professional head coaches, experienced mentors, well-managed group runs on the St. Louis area’s best paths, access to an extensive lineup of health care professionals, and informational clinics on nutrition, hydration, gear, injury prevention, stretching techniques, and more. Why join our 26.2mi programs? Individualized training in a group setting. Our proven program has served more than three thousand marathoners. Over the past decade, participants have given the program an average rating of 4.8 stars (out of five) and more than 90% have completed their goal race. Our community is vast. You won't be alone! Our experienced mentors offer support and motivation to athletes in a wide variety of pace groups. Multiple weekly group workouts. Team members are invited to participate in two or three coached workouts each week, depending on their program. Additional social runs are available, as well. 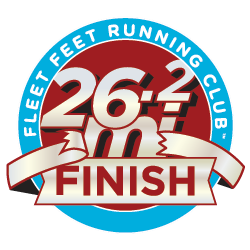 Our 26.2mi Finish program is appropriate for anyone who wants to enjoy training to run 26.2 miles between 3 hours (8:00/mile long run training pace) and 5¼ hours (13:00/mile long run training pace). We welcome first-time marathoners and veterans looking for a structured program that will prepare them to run a personal best. 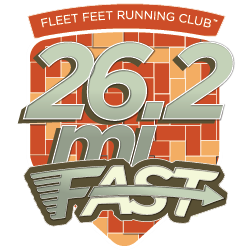 Our 26.2mi Fast program is for experienced marathoners who have made the transition from completing to competing and want to run a Personal Record (PR) for their age, Boston Marathon qualifying time, or similar very challenging effort. Program applicants are first assessed by our professional coaches and - if they have the foundation needed to attain their goal - are accepted into this positive, driven training environment. Our Summer 26.2mi Finish and Summer 26.2mi Fast programs will begin with a kickoff meeting on June 29th at 6:30am at our Des Peres store. We train Tuesday evenings and Saturday mornings. Folks in our 26.2mi Fast program meet on Sunday mornings, too. If you are an Active-level member of Fleet Feet Running Club (FFRC), we invite you to pass the time before your program begins by joining us for our Thursday evening and Sunday morning social runs. If you are not yet an Active member, we hope you will register and then join us. Among other benefits, Active FFRC members receive a discount on training programs. To become an Active member, click here. To register for our Summer 26.2mi Finish program, click here. To register for our Summer 26.2mi Fast program, click here. 26.2mi Training Cost: Active-level club members receive a 15% discount.